Settle in again folks, this will be some great reading! Nick and I headed to TWS and met Wade for a TWS MSC DE event and Misty (Chief Instructor) was kind enough to let me yell at instruct the two WDMS drivers. 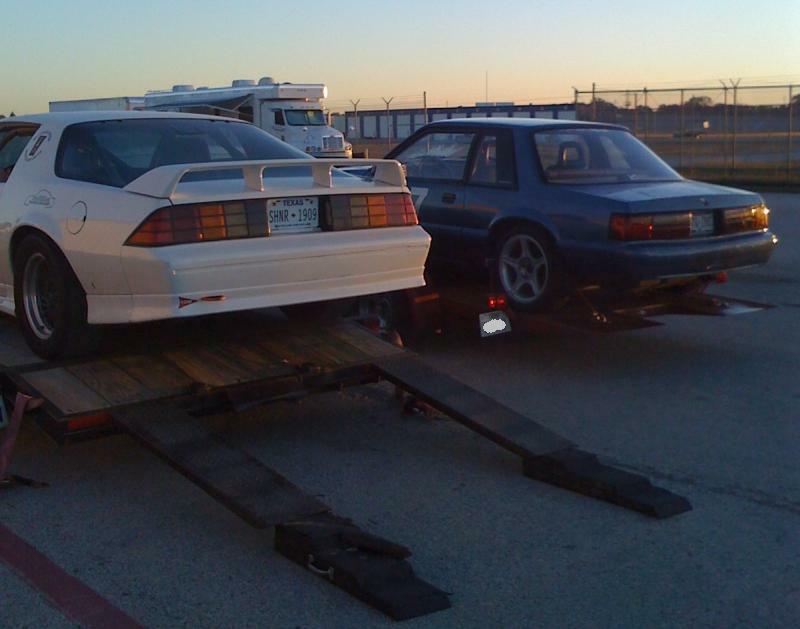 Nick had a few track days under his belt, but Wade was a noob. He'd ridden around TWS with me and a few others and worked corners a bunch, but never taken to the track in anger. So, with no further pause, here is Wade's report and Nick's follows next. Enjoy! Time for my first track day. 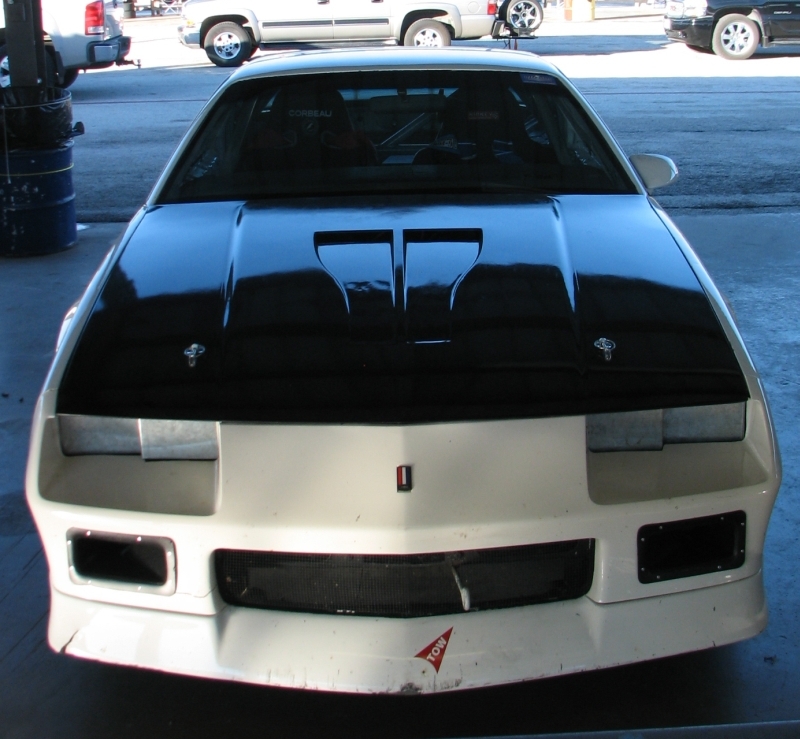 I have been working on this Mustang Coupe for five years. 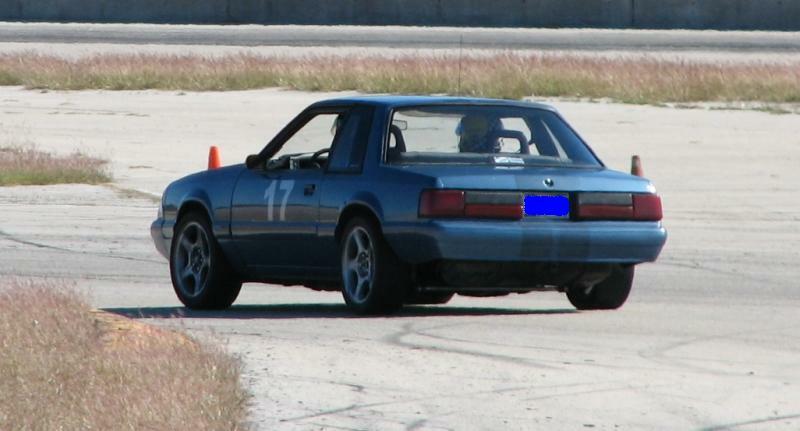 If you know Mustangs, making one turn isn’t easy, so the fact that I am to this point, this fast, is a remarkable feat. Rewind back a month from today and Nick is asking if I am going to TWS on Nov 8-9. I tell him I will think about it. Two or three days later, he asks again. Same response. Two more days, he sends me the website to register. Two days after that, I bite the bullet. The very next morning, Nick calls. He says he sees that I have paid. It’s all down hill now as I am committed. I have a lot of work to do; fire extinguisher, numbers, sticking brake caliper, crooked rear end, flush and fill the brake fluid, new pads, and more. Needless to say, with much prodding from Nick, and a few last minute preparations, I was ready for my first DE. Now for the fun part…and let me tell you, it was a BLAST! The only reason I can ever tell you to NOT do a DE is because once you do, you will be hooked! Nick and Costas drive in to TWS early Saturday morning. I arrive at the track at 0700 and they are just beginning to unload. Paul and I have garage spots side by side with Nick just across in front of Paul. We all unload and go to our respective registrations, driver’s meetings, and me to my first classroom sessions. I have worked safety and flags many times at TWS before, so I have the basic track layout memorized, and the corner numbers in my head. This classroom session is a breeze and I leave with some renewed confidence that I can do this. First track session: Double Yellow, NO passing, NO helmets. This is strictly time to learn the track and get a feel for the car. I think it is also an opportunity for instructors to get a feel for their students before they go all out and do something they both regret! A confidence builder all the way around. Costas makes me move in grid. He wants me up front so we can get some open track without all of the traffic. His plan works and we get 3-4 nearly clean laps before we get held up behind a silver miata. There is a beautiful 1969 Yellow Mach 1 behind me coming onto the front straight. We are still no passing, so Costas tells me to lay back off the Miata so that I can get a good look at turn 1 at the end of the straight. All of a sudden, the Mach 1 blows by me! Costas is pissed. I was a little miffed too. I think part of the whole school is following directions. FAIL. I follow the Mach 1 for a few more laps and the session ends uneventfully. Costas has a word with the Mach 1 driver’s instructor, and then with the driver back in the paddock. He won’t make that mistake again. Classroom session two: I skipped it. Oops. Track session two: More improvement. Learning the line, getting a feel for the car, building confidence, grinning from ear to ear. Costas seems pleased and tells me I am doing a good job. Classroom Session Three: More basics. Nothing I haven’t heard before in OD101 or from hanging around the track for years. Track Session Three: More fun! Getting faster, more confident. Beginning to realize that the car will take some abuse and just keeps chugging. Passing people like crazy. Wait passing? Yes, and lots of it. 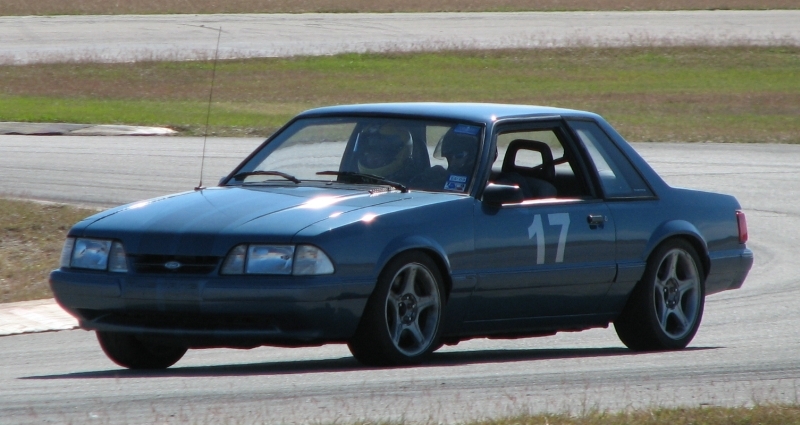 I follow a beautiful 2007 Blue Mustang GT around the track for ½ a lap. Paul is irritated. I think we are about the same speed, but I am told to get up on his bumper and pass. Three or four turns later, I can’t even see him in the rearview any more. I am a little shocked, but I am on race tires, with a torque arm. Bye Bye. Track session Four: I am getting ready to go out and Costas reminds me to check my fluids, tire wear, etc. I flick on the key and check the fuel gauge. ¼. I just ran three twenty minute sessions and I am almost out of gas. Holy crap! I go put in six gallons at the track pumps. The gas is reasonable, and convenient. Costas and I take the track for the last session. I am really getting the hang of this and am learning to “bend it” in turns 1-2, 4, 5, and 7. Turns 8, 10, and 13 are throw aways. Go slow here to make more speed on the next one. I am having so much fun…dang. Stuck in traffic again. All day stuck in traffic and not getting the full view of the track. Some of the other drivers are really slow. Some of the cars are really slow. There is too much traffic to learn more here. Maybe some of them are only driving Saturday? Dinner at Wings&More with Costas, Nick, Bill (turbo BMW) and Ben (yellow Porsche GT3). We have a good time, but everyone is tired so we call it a night. Hunter is hanging out at the house so we all have some ice cream, (BlueBell FTW!! !....-Costas) and it’s time for bed…2100. Geez it’s early but I am tired….zzzzzzzzzzzzzz. Track session 5: We grid up front and take the track. One lap under yellow and I get passed shortly after the green flag drops. Then passed again. Can I run with this group? Wait…there’s a slow mover that I easily sneak by. There is very very little traffic and my line is getting better and better. I am hitting more marks and generally getting faster. What a blast! Classroom Session 4: I decide to go since this is blue classroom instead of green. There is a lot of discussion about proper passing, signaling, and about which corners are causing problems for people. It is a good opportunity to hear everyone analyze the track and I soak it all in. Track Session 6: More of the same: fast laps, sparse traffic, beeeeend it in the corners, liiiiiitle brakes, gas…allll of it. Costas is great. He’s been screaming directions all weekend. I can’t believe he can still talk. All of a sudden we are in turn 15 storming onto the front straight and Paul spies a nearly brand new dark grey Porsche 911 crossing the start finish line. He tells me to run with him. I am thinking, ya right, I have to catch him first! Sure enough, the guy nearly parks it in T1. I reel him in and try to hang with him. He puuuulllls away on the 2-3 straight, but brakes way early. I can’t make up any time on acceleration, but I out brake him by a mile (and your corner speeds smoked his also! -Costas). I think he freaked out a little and he late apexes T3. I run the line and am back on him soon. I’m not exactly sure what happened next, but I think he thought he got away? I get right on his rear bumper going over the hump on the 3-4 straight and then the guy looks in his rear view. Well guess what dood? His mirror is FULL of blue Mustang (and such a PRETTY blue it is...-Costas). The guy freezes and totally misses the apex to turn 4. As a matter of fact, his just flat out misses turn 4. I am running the line ("watch the track, not the car in front of you! Run your line!") so I pass him with about 40 feet between us as he goes four wheels off driver’s left. Oops. We pedal away quickly and snicker a little bit. I think he is checking his shorts. Track session 7: Fill up with gas again (this is the third time). This is the most fun I have ever had. Better lines, concentrate, get faster. Track session 8: Last one of the day. I have run consistent 2:13’s to 2:15’s for the last few sessions with one high 2:12. Paul tells me to slow down, drive the line and save the car as the water temp gauge soars to 230 degrees. I shift into 5th and take it easy for a lap, letting a few cars run by. I get back in it for a few laps and I see a familiar green Fox up ahead with silver stripes. 'No way', I think to myself. My friends Sam and Darcie have been tracking this car for months and I have helped them work on it a few times. I have even ridden in it with Sam earlier in the weekend. I can’t believe they are up ahead so I mat the go pedal and start to reel them in. They have a new motor as of a few months ago, so I don’t pick up any ground on the straights. Unfortunately for them, I have not-so-secret weapons Mr. Torque Arm and Mr. Race Tires. I can hardly contain my excitement as I pass in the short chute and motor into T12. My weekend is done. We load up and get ready to head home and Paul heads off to the final instructors meeting. He shows me my student evaluation form on the way off. I got an “A” in every category and just need some more seat time to solo. He is happy. I am HaPpY! It only takes once to be hooked! 3:30am is a helluva time to wake up and drive to the track. But we're crazy like that. Wake up, head out, run over a raccoon (sorry little fella! ), arrive in College Station. We met Wade at TWS, and while I was still setting up my ramps to unload my car, Wade makes sure to pull in next to me with his rollback and show me what a real trailer can do ;-) When I started up the car on the trailer, it clicked for a second or so, then fired right up. Hmmmm. OK.
Back in to the pits, we try to start it again, no dice. Figure it's the battery gone bonkers after being tossed around by the mad axle hop. Wade and Paul head out on track, and I pull my truck around to try to jump Alamo. Hook it up, and it fires right up. Let it idle for a second, all is well. Turn it off, try to restart it, clicks for a second, stumbles, and barely fires up. Great, battery is toast. 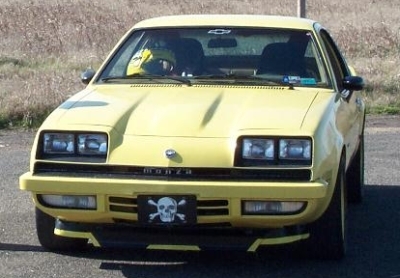 Head off to Autozone to swap out for an Optima. Optima goes in, car fires up in a second. Good. Paul recommends we drop the rear pressures, and adjust the brake bias. Both good ideas, they helped the car immense (You know me...here to help! -Costas). Second session we head back out, and Costas begins to pick on my bad habits some more. You think you're going to downshift HERE? *FWAP* on the wrist. You think you're going to use more brakes? Well I can yell louder. Everything he told me or corrected me on kept shaving time off my laps. Greatness. Bad habits are hard to overcome, but we were working on it. I was learning much better lines around the track than I previously knew, it was just hard work to keep hitting all the right marks every time. And turn 1. Omfg turn 1. Turn 1 is one of those "ohhhhhh cr4p" turns. Do it right, you make up lots of time, and doing it right takes some stones. I was slowly working up to doing it right. Between sessions Costas took me out in the B4C and proceeded to show me the correct way to do it. It's one thing to do it while someone is coaching you, but to see the correct line from the passenger seat helps a lot. And it's also a blast riding with Paul! Heh. By session 3 I had begun taking turn 1 lots faster, and we kept shaving time off the laps. It was greatness. I was having a blast. Driving TWS is crazy fun. Driving TWS the correct way is just insane mad loopy fun. I think the only "oh noes" moment of the day was coming off turn 9 a little too hot, and barely dropping a wheel off at the bottom of the hill. If you're unfamilar with this area, it's one of the worst areas to go off at TWS. They made sure to point it out during the n00b sessions I had with NASA as well. We didn't drop off, it just made the car unsettle and hit a big dip. I realized what I had done was not to be done again, and Costas made sure to remind me. "Never do that AGAIN". The rest of the session was more "BEND, GAS, NO MORE BRAKE". I think by the end of the day, my times had shaved about 6-7 seconds from the first session. I was ecstatic. The second day begun and I soon found that Paul had bumped us up. I went to Yellow, and Wade went to Blue! Sweeeet! I was soloed for the day and would have a chance to work on everything I had soaked up the day before. Before the first session I had put some oil in the car, as it was reading a little low. And silly me, I forgot to put the PCV valve back in (yeah, my valve covers have no oil cap). So by the 3rd or 4th lap, I finally figured out what the mist on my windshield was. I don't have great luck in first sessions apparently. Came in to the paddock, and cleaned off all the excess oil that went on the windshield. Ugh. Second session. Let's see if I can make this one work. Second session went off without a hitch. 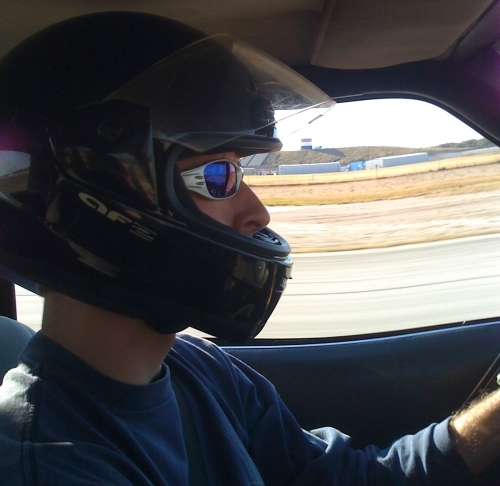 I took my time making sure I was driving the right line, and working up to going faster faster faster. Even when Paul isn't in the car, you can still hear him coaching from the passenger seat. After the second session, we went and got lunch and they announced parade laps. I told Costas he should take my car out and see if he wanted to drive it during his red group session, see how it shakes out. He doesn't argue. So he takes Wade out on a few parade laps and has at it. 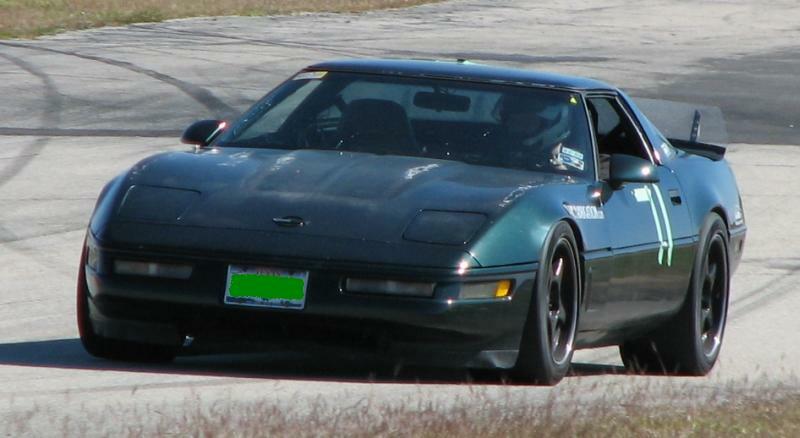 During the next instructor session Costas took Alamo out for a few runs, and we sat on the sidelines timing his laps. The first two hot laps he took were about 6 seconds faster than my fastest laps at the end of Saturday. Yeah, I know I've got work to do. He came in after a few laps, and told me to get in. He took me around TWS in Alamo and was flying. With a fresh set of tires and some more tweaking, the car will be suh-weet. 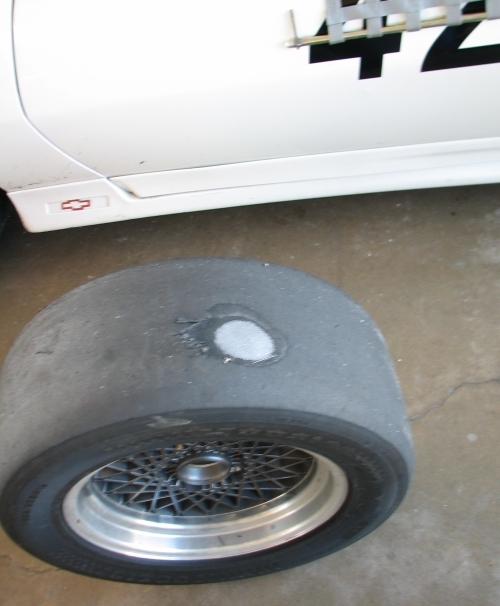 Before the last session I found the right rear tire had corded. Great. Luckily Paul had brought along a second set of wheels and tires, so I "borrowed" one of his wheels to replace the corded one to get my last session done. The last session I did went well. I worked a lot more on driving right, looking ahead, making sure I was being consistent and hitting all the right marks each time. I could feel myself gaining speed, and getting a little bit quicker each time. The weekend was a blast. Thanks to Costas' great instruction, I made a huge leap forward and had an eye opener on what I was doing right and wrong. Knowing what you need to work on specifically instead of generally helps a ton. My evaluation sheet said I need more seat time to get that last 5%, and I'll definitely be working on that in the coming months. I don't have too much to add here. Both these guys did incredible. I am totally reminded of the likes of McCampbell and Countryman who were also just stupid-fast right out of the box. Nick blended into blue well and excelled quite nicely, but Wade was truly the wolf among the sheep in green. Sheesh. They both needed a jump by mid-day Saturday, but I didn't want to step on any toes. The MSC group runs a GREAT event and it is very laid back, but also well supervised. Good communication from workers to instructors and Misty is well organized. Very sweet. Nick's car is like the B4C on 'roids. More power, much better spring rate, stiffer chassis. Very slick. Makes me want to mod mine...(must....resist.....). Wade's car is very impressive also and I really liked his new Toyos. We beat on those things pretty hard and they held up great. Very consistent and predictable. The coil-overs and torque arm work VERY well and more than a few <insert expensive car here> drivers stopped in to check out the car after they'd been passed by it. 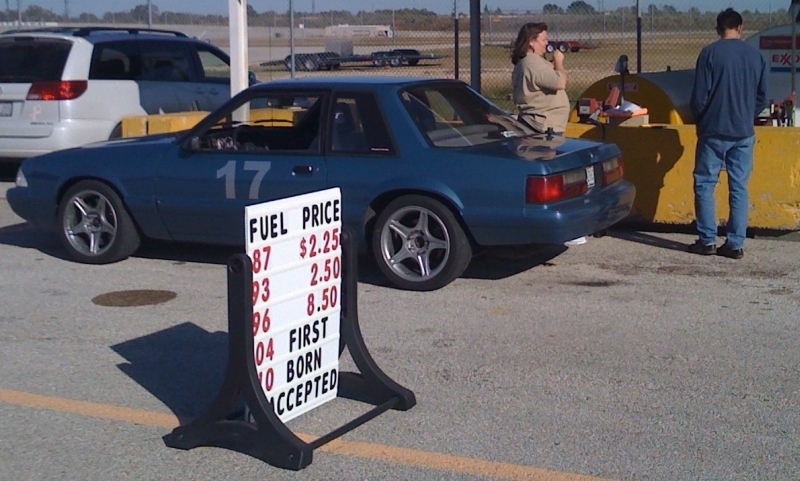 In the spirit of our recent LeMons race, neither driver had any offs, spins or black flags. Very well done and I look forward to watching (and helping if they'd like) them move further up the Pyramid of Speed towards wheel2wheel action!! Chad was out with his new 383 and it sounded awesome. He's working on some small problems, but it looked great out there!